Amman (English pronunciation: /ɑːˈmɑːn/; Arabic: عمّان ʻammān pronounced [ʕamːaːn]) is the capital and most populous city of Jordan, and the country's economic, political and cultural centre. 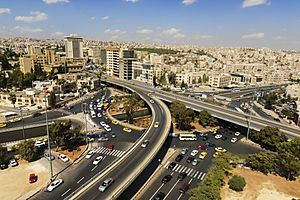 Situated in north-central Jordan, Amman is the administrative centre of the Amman Governorate. The city has a population of 4,007,526 and a land area of 1,680 square kilometres (648.7 square miles). Today, Amman is considered to be among the most liberal and westernized Arab cities. It is a major tourist destination in the region, particularly among Arab and European tourists. The earliest evidence of settlement in the area is a Neolithic site known as 'Ain Ghazal. Its successor was known as "Rabbath Ammon", which was the capital of the Ammonites, then as "Philadelphia", and finally as Amman. It was initially built on seven hills but now spans over 19 hills combining 27 districts, which are administered by the Greater Amman Municipality headed by its mayor Yousef Al-Shawarbeh. Approximately two million visitors arrived in Amman in 2014, which made it the 93rd most visited city in the world and the 5th most visited Arab city. 'Ain Ghazal Statues are considered to be one of the oldest human statues ever found, on display at The Jordan Museum. Dating back to 7250 BC. 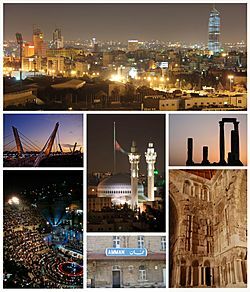 Throughout history, Amman has been inhabited by several civilizations. 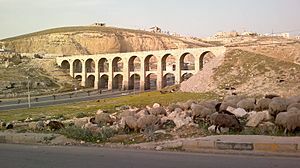 The first civilization on record is during the Neolithic period, around 8500 BC, when archaeological discoveries in 'Ain Ghazal, located in eastern Amman, showed evidence of not only a settled life but also the growth of artistic work, which suggests that a well-developed civilization inhabited the city at that time. In the 13th century BC Amman was called Rabbath Ammon or Rabat Amon by the Ammonites (רַבַּת עַמּוֹן, Standard Hebrew Rabbat ʿAmmon, Tiberian Hebrew Rabbaṯ ʿAmmôn). It was later conquered by the Assyrians, followed by the Persians, and then the Greeks. Ptolemy II Philadelphus, the Hellenic ruler of Egypt, renamed it Philadelphia. The city became part of the Nabataean kingdom until AD 106 when Philadelphia came under Roman control and joined the Decapolis. In 324 AD, Christianity became the religion of the empire and Philadelphia became the seat of a bishopric during the beginning of the Byzantine era. One of the churches of this period can be seen on the city's Citadel. 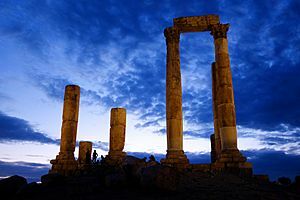 Philadelphia was renamed Amman during the Ghassanian era, and flourished under the Caliphates (with nearby capital) of the Umayyads (in Damascus) and the Abbasids (in Baghdad). It was then destroyed by several earthquakes and natural disasters and remained a small village and a pile of ruins until the Circassians settlement in 1887. The tide changed when the Ottoman Sultan decided to build the Hejaz railway, linking Damascus and Medina, facilitating both the annual haj pilgrimage and permanent trade, putting Amman, a major station, back on the commercial map. In 1921, Abdullah I chose Amman as seat of government for his newly-created state, the Emirate of Transjordan, and later as the capital of the Hashemite Kingdom of Jordan. As there was no palatial building, he started his reign from the station, with his office in a train car. Amman remained a small city until 1948, when the population expanded considerably due to an influx of Palestinian refugees from the occupied territories. Amman has experienced exceptionally rapid development since 1952 under the leadership of two Hashemite Kings, Hussein of Jordan and Abdullah II of Jordan. In 1970, Amman was the site of major clashes between the PLO and the Jordanian army. Everything around the Royal Palace sustained heavy damage from shelling. Most of Amman suffered great damage from PLO rockets and the Jordanian army's shells. The city's population continues to expand at a dizzying pace (fueled by refugees escaping the wartime events in the occupied territories and Iraq). The city received refugees from these countries on a number of occasions. The first wave of Palestinian refugees arrived from the occupied territories in 1948. A second wave after the Six Day War in 1967. A third wave of Palestinian and Jordanian and South East Asians, working as domestic servants, refugees arrived in Amman from Kuwait after the Gulf War of 1991. The first wave of Iraqi refugees settled in the city after the first Gulf War. A second wave also began arriving after the invasion and occupation of Iraq in 2003. 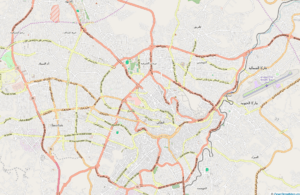 During the last 10 years the amount of new building within the city has increased dramatically with new districts of the city being founded at a very rapid pace (particularly so in West Amman), straining the very scarce water supplies of Jordan as a whole, and exposing Amman to the hazards of rapid expansion in the absence of careful municipal planning. Amman's position on the mountains near the Mediterranean climate zone places it under the semi-arid climate classification. The banking sector is one of the principal foundations of Jordan's economy. Amman is the base city for the international Arab Bank, one of the largest financial institutions in the Middle East, serving clients in more than 600 branches in 30 countries on five continents. The population of the city reached 4,007,526 in 2015, Amman contains about 42% of Jordan's entire population. The population of Amman has risen exponentially with the successive waves of immigrants and refugees arriving throughout the 20th century. From a population of roughly 1,000 in 1890, Amman grew to around 1,000,000 inhabitants in 1990, primarily as a result of immigration, but also due to the high birthrate in the city. Amman has a mostly Sunni Muslim population, and the city contains numerous mosques. 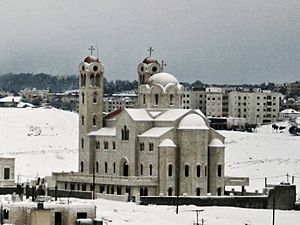 Large numbers of Christians from throughout Jordan, particularly from al-Salt, have moved to Amman. A panoramic view of east Amman from atop the Amman Citadel overlooking the Roman amphitheater. The main airport serving Amman is Queen Alia International Airport, situated about 30 km (18.64 mi) south of Amman. Much smaller is Amman Civil Airport, a one-terminal airport that serves primarily domestic and nearby international routes and the army. 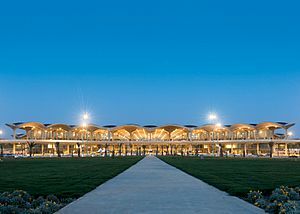 Queen Alia International Airport is the major international airport in Jordan and the hub for Royal Jordanian, the flag carrier. Its expansion was recently done and modified, including the decommissioning of the old terminals and the commissioning of new terminals costing $700M, to handle over 16 million passengers annually. There are eight circles, or roundabouts, that span and connect west Amman. The city has frequent bus connections to other cities in Jordan, as well as to major cities in neighboring countries; the latter are also served by service taxis. Internal transport is served by a number of bus routes and taxis. Service taxis, which most often operate on fixed routes, are readily available and inexpensive. Amman Facts for Kids. Kiddle Encyclopedia.